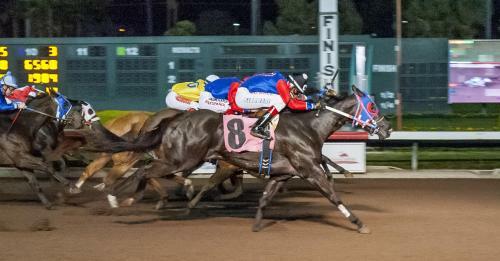 Bred by Dr. Steve Burns, the Favorite Cartel filly won the Jerry Stojan Memorial Stakes and the Evergreen Park Juvenile Challenge at Grande Prairie in Alberta. She also won the Grade 3 Canada Quarter Horse Cup Futurity at Century Downs located in Southern Alberta. Following a fifth place finish in the John Deere Juvenile, Singles Cruise had done well at Los Alamitos. She won her trial to the Grade 1 Los Alamitos Winter Championship and finished eighth to multiple stakes winner Powerful Favorite in the final. She came into the James Smith after running second to Juan Carlos Chavez’s Striver in the Dreaming Sweet Handicap. Singles Cruise earned $11,000 for the win to take her career earnings to $83,377.